The new version of ZipCloud has many new features. They have added a 'Drag & Drop' functionality to the online backup software. This makes it really easy to back up specific files and folders without having to navigate to them using the manual selection method. The settings have been improved to include a much more effective scheduling tool. It has a calender for specific days, the ability to set a daily backup start time, and a 'pause between times' section. Other improvements are that the website is cleaner and more responsive. It is much easier to navigate the files and share them. Installing ZipCloud is easy on both Mac and PC. They have mastered the art of making it easy to get started. Once the software is installed, the backup process begins immediately. Once again, this part is very simple. All it takes is a little bit of knowledge about where your files are stored. There is a 2MB upload limit which is good for the first backup. Initial backups can take a while otherwise. This setting can be changed to unlimited in the settings area. Getting your files back should they be lost, is crucial. We found ZipCloud handles this well. It's very easy, simply navigate to the files you want to restore and download them using the software on the computer or through their website. At this time you can access the site via mobile phone and download images and music. 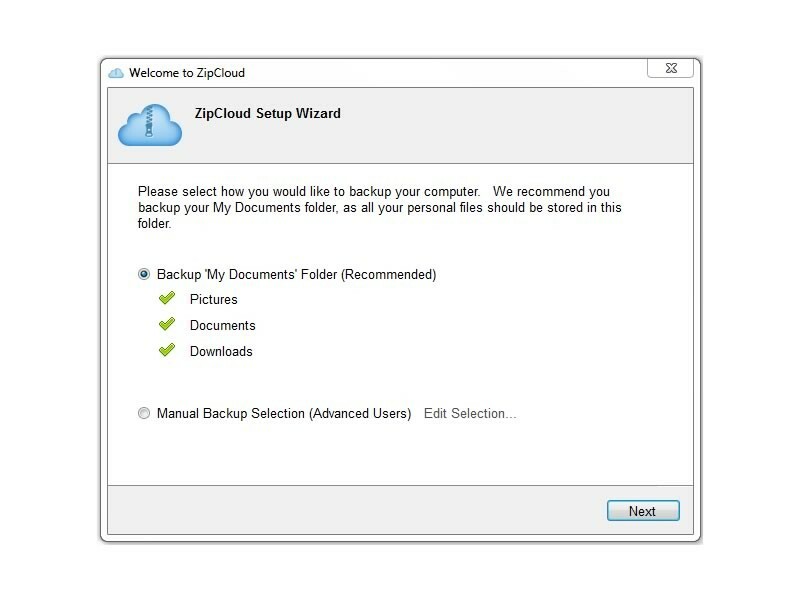 The way ZipCloud handles file syncing is by providing a free 1GB sync folder with the online backup account. Using the Sync Folder gets files from one computer to another and also opens up the opportunity to share with others. To share files either use the Sync Folder for multiple computers or use the web interface to share with anyone. The recipient must sign up for a free account with ZipCloud to access files that are shared with them. Since the software was very easy to use and self explanatory we haven't needed tech support for anything. Check back in the future for updates. 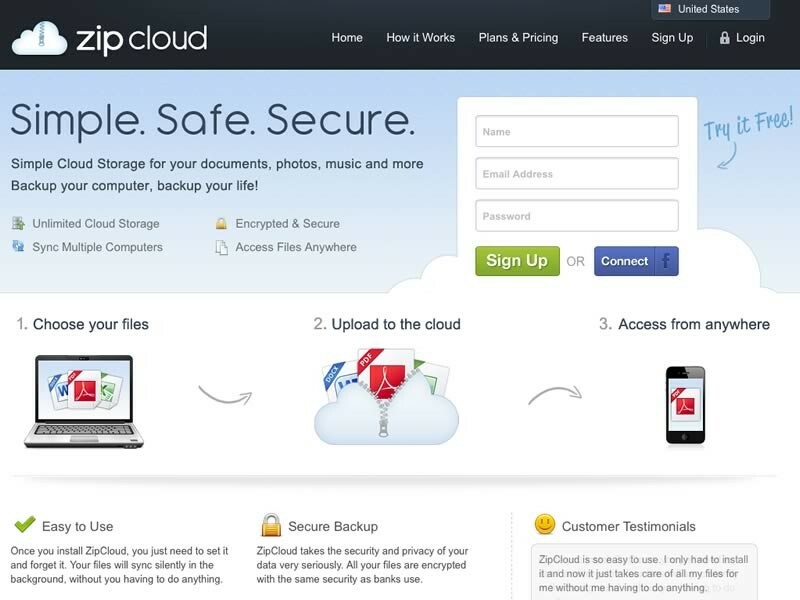 ZipCloud has become a favorite of ours because they combine online backup and cloud storage within the same service. They have slight drawbacks like not having a large sync folder and some features cost extra, but these were very minor for us. Overall they did exactly what they said they would do. We felt we got more than we hoped for and it was very easy to use. ZipCloud does a great job at being very easy to use. They provide syncing capabilities combined with traditional online backup. The software is easy to use and backs up without issue. We felt that they could have offered more sync folder space, but other than that they are great. Because of their eye for detail and ability to adapt online backup and syncing while making it accessible is what makes them a great company. I have been very happy with my ZipCloud decision. I have lots of photographs and needed about 120GB of space. It took a few days or so to back all of the data up, to be fair I have a lot of data and it just takes time to copy. In case you do not know ZipCloud uses Amazon Cloud Storage for their system. So you know the servers are fast and reliable. After some research most of the world uses Amazon Cloud services, Dropbox, instagram and thousands of others. Anyway the service has been great. I have not needed customer support so I can not provide any real insight there but I know they are their to help so I gave them a 8 in good faith. Should I have a problem I will update the review. Final word is I am glad I went with ZipCloud, I have been happy and more importantly I was glad to have my backup search over. I Think ZipCloud is great because right after install it started backing up right away. The main reason i wanted to get online backup was in order to get my kids pictures backed up. I did it in just a few hours. ZipCloud made me feel like a pro. I looked into some of the scheduling options and realized it costs more to do hourly backups, so i decided not to get them. I recommend them to all my friends. I feel like all my pictures are safe and i have been able to download them and share them easily. I was looking for a company that would let me backup my pictures from my computer really easily. ZipCloud is one of the best companies providing Cloud Storage with Unlimited Data Plans, File Sharing and Syncing Features and Excellent Customer Support. 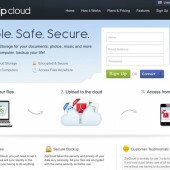 Zip Cloud is one of our favorite cloud storage solutions. They offer great prices, unlimited data storage and great tech support. They are one of the newer companies in the market and they are bringing a new energy to the cloud storage space. You can run zip cloud on Windows / Apple / iPhones / iPads / Windows Mobile and Blackberry. ZipCloud provides all of the standard backup features including a scheduler, Incremental Backup, Versioning and Snapshot and idle computer backups. They lack several of the advanced features the large enterprise or corporations would need such as multiple users. Zipcloud has been making big waves and is a great fit for Individuals, Families and small businesses. Unlimited Storage - $4.95/Month All features included. ZipCloud was founded in 2011 by Just Develop.it and have over 150 people on staff. Use this link with coupon code to save some money.